Reef Tiger Geographer watch is adopted well-thought-out to the level scientific research design. The day indicator displays at 10 o'clock on the dial. The day can be adjusted by the complimentary tool with the purchased watch. When the watch is wound up, the power reserve is to reach 40 hours at least. 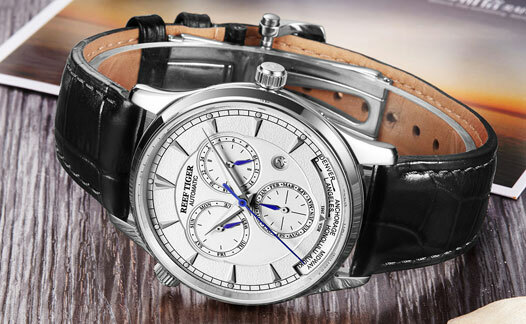 The power reserve of RT7151 automatic movement is about 48 hours. 24 hours indicate with pointer displays at 2 o'clock. You can press the button on the case at 2:00 to adjust it. But please do not adjust it between 8:30 pm and 3:30 am the next morning, because the day function is changing during this time. And the month indicator sub-dial displays at 6 o'clock. In addition, there is world time indicator showing under this sub-dial. 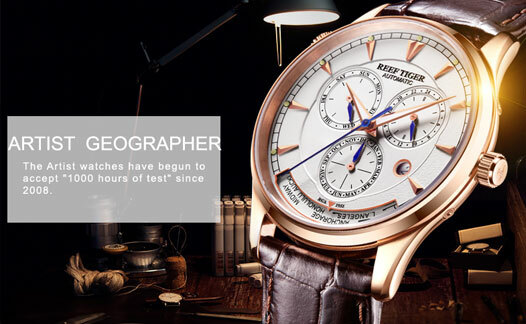 Reef Tiger Geographer series of watches supply two models for choice, including stainless steel item and rose gold one. Geographer watch has mixed the traditional elements. The case in a diameter of 41mm is elegant and generous; Thickness of 10mm brings full texture; And the bezel ring with arc design and the crown with gear shape reveals deep vintage style. With rounded watch body, the watch lugs are adopted L-type design. But using the screws to connect the lugs and straps, the rugged screw and slim lugs make contrast; such a collocation brings a kind of different beauty. The design idea of the Geographer watch movement comes from the master Michelangelo of the Renaissance. The movement is carved with sculpture methods and polished. The beauty of time passes appeal in the rotation of the movement. To highlight the beauty of the running movement, Geographer watch only has hour and minute pointers. Willow leaf pointers bring us French elegance, which is to perfectly connect with sword-shape time scales. It is exquisite and vivid. 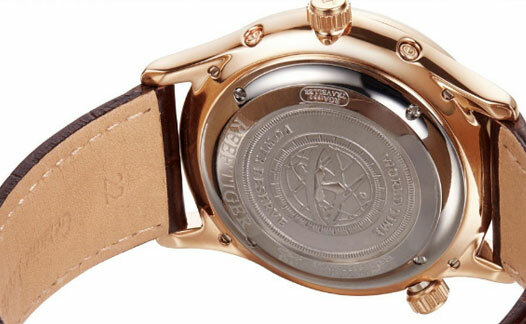 Geographer wristwatch matches Italy imported calf leather strap with special design fold-over clasp. The soft and comfortable strap together with smooth and beautiful clasp shows the exquisite elegance and taste.